The number one priority is to stop Ebola as fast as possible and “get ahead of the virus,” the chief of the United Nations emergency response mission said as the UN health agency today reported that efforts to contain the outbreak in West Africa are being hampered by cumbersome diagnostic tests. The UN World Health Organization (WHO) said that standard tests used in mobile and other laboratories need 2 to 6 hours to test for Ebola and cost around $100, but these requirements are difficult to meet in resource-constrained West African settings, thus severely limiting testing capacity. “Efforts to contain the Ebola outbreaks in West Africa are currently hampered by cumbersome, slow, and complex diagnostic tests that imposed a number of additional logistical challenges, including requirements for a high level of laboratory biosafety and staff expertise in using sophisticated machines,” WHO spokeswoman Fadela Chaib told reporters in Geneva. According to WHO statistics as of a week ago, there are more than 13,000 reported Ebola cases in eight countries since the outbreak began, with nearly 5,000 reported deaths. The response needed is more of what the international community can provide, Mr. Banbury continued, citing the expertise required on myriad fronts, ranging from communications, medical, construction to engineering needs, as well as resource intensive needs such as treatment and care facilities, and the staff, supplies, logistics support for them. “UNMEER is working very, very hard to bring greater capability on the ground so that we can bring this crisis to an end as quickly as possible,” he said. Mr. Banbury also said it was “heart-breaking” when survivors of the disease are not welcomed back to their community when they’re fully healthy. “So we have a long, hard fight ahead of us, but we’re headed in the right direction, he said. The UN World Food Programme (WFP), meanwhile, reported that it has reached its target of 1.3 million people in the three Ebola affected countries – Guinea, Sierra Leone and Liberia. WFP said it is now reviewing its requirements to broaden its response to address the food security and nutrition challenges of Ebola-affected communities based on the latest available assessments. UNICEF also reported that in Sierra Leone, its social mobilization work has put out 200,000 posters, 400,000 factsheets and sent some 1.5 million text messages. 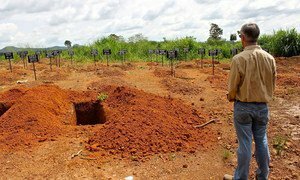 The United Nations health agency today announced a new burial protocol for Ebola victims aimed at reducing the risk of exposure to the disease for family members as they bury their loved ones in accordance with religious rites amid Organization-wide efforts to control the deadly outbreak by a 1 December deadline.